Sound Percussion focuses on preparing students for all of the challenges they will face when performing on the timpani, including tuning the drums, fine-tuning the pitches, sticking and alternate sticking, and many more specialized skills. Throughout the book, timpani are treated not only as a supportive accompaniment but also as a melodic voice in the percussion ensemble. Timpani parts usually support the tonic, subdominant, and dominant harmonies in music. While many of the exercises and examples follow suit, some of the exercises use other diatonic notes to allow students to gain experience tuning notes outside of the standard treatment. The timpani parts include one, two, and three notes per exercise allowing for great musical variety. 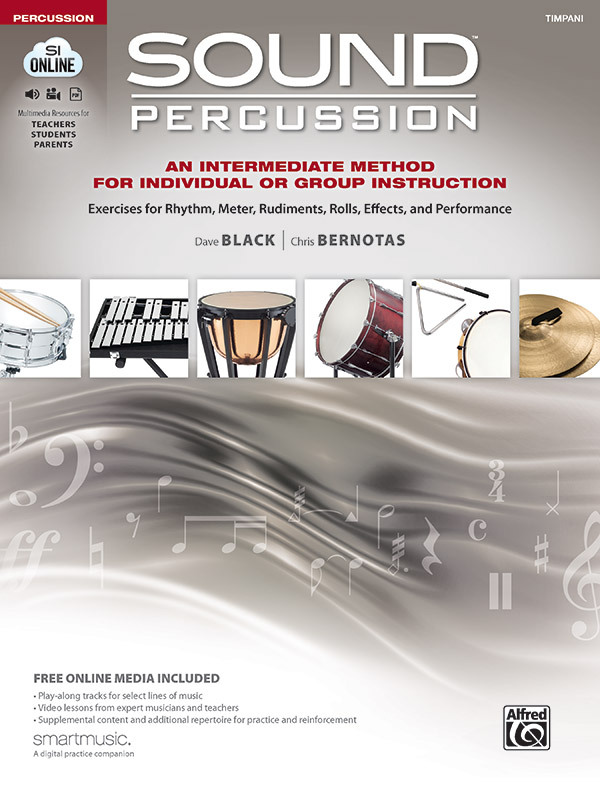 The Your Instrument section explains instrument parts, setup, stick selection, mallet grip, playing position, and more. Students and directors will find the range chart particularly helpful to ensure the proper tuning of the drums. As with all new skills in Sound Percussion, new rhythms are introduced in the Sound Rhythms section in unison (when appropriate) and in 4/4 to provide clarity before introducing more complicated time signatures and syncopation. Some rhythms have been simplified for timpani to maintain rhythmic clarity. While those playing snare drum focus on the more advanced rudiments, timpanists will learn how to apply and experiment with sticking patterns. Their focus is to find patterns that allow for the most musical and comfortable performance of their parts while supporting the rudimental study. The Sound Meter section introduces meters first starting with simple meters, followed by compound meter, then asymmetrical meter, making students prepared and confident for the last level that features changing meter. The Sound Rolls section introduces both single and double drum rolls. Rolls are approached with exercises that help students understand and apply the subdivision underneath each roll. Necessary skills are isolated and experimentation is encouraged to help students learn to develop a clean, clear sound. Sound effects such as gong and cymbal glissandos, harmonics, and more are included at the end of the book.